This spice mix is for a spicy potato curry. Contains onion seeds, turmeric, cumin, mustard seeds and other spices. Contains recipes for Spicy Potatoes Curry and Chickpea Curry. Spice mixture to make a lamb entree cooked tenderly in a deliciously mouth-watering, pickle spice curry. 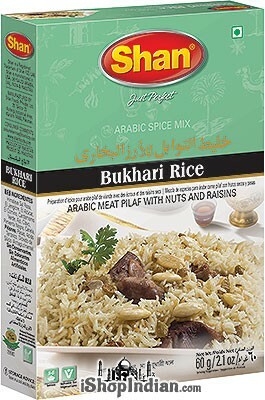 Arabic mild meat pilaf. 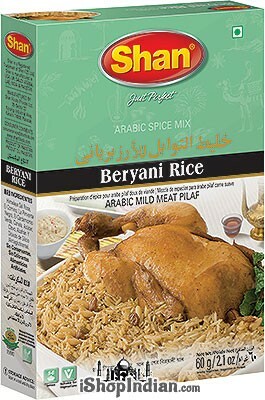 Can be used with chicken/lamb/mutton. Also required for this recipe is rice, onions, butter/oil, hot water and yogurt. Recipe provided on box. Ingredients: himalayan pink salt, cumin, black pepper, green cardamom, cinnamon, sugar, clove, saffron and silicon dioxide. Extra Tender BBQ meat strips. Raw pawpaw/papaya is used to tenderize the meat that is wrapped on skewers with thread. Arabic meat pilaf with nuts and raisins. Also required for this recipe is rice, onions, cooking oil/butter and hot water. Recipe provided on box. Ingredients: himalayan pink salt, ginger, sugar, cumin, green cardamom, garlic, clove, black pepper, cinnamon. Use this spice mix to make a juicy chicken dish in a rich tomato and butter sauce. All you need for easy preparation is: Shan Spice Mix, Chicken, Tomatoes, Lemon Juice, Milk, Fresh Cream and Butter. 30 Min. Stovetop. This spice mix is used to make a Peshawari stype crisp brown, deep-fried meat and spice patty. Perfect for a snack! Spicy batter-coated fried chicken. Western style with Eastern taste. Spice mix for chicken handi, juicy chicken in creamy tomato sauce. Ingredients: salt, coriander, red chilli, black pepper, ginger, garlic, paprika, aniseed, turmeric, cumin, green cardamom, tartaric acid, almond, coconut powder, citric acid, maltodextrin, hydrolyzed soy protein, cane sugar, canola oil, silicondioxide. Royal piquant chicken in a delicious yogurt curry. A delightful dish loved by all. Ingredients include red chilli, salt, turmeric, coriander, cinnamon and other spices. New Shan mix to create a succulent, tender chicken dish in a white onion and yogurt sauce. The following basic ingredients are needed: Chicken, onion, garlic paste, ginger paste, green chillies, lemon juice, plain yogurt and oil. 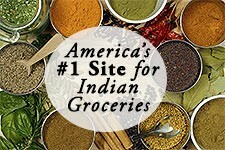 Enjoy the best of Indian cuisine with world-renown Shan brand spices mixes. Enjoy delicacies like Chicken Tandoori, Bombay Biryani Rice Dish, Nihari Curry and a free pack of Shan Butter Chicken Mix. Shan recipe spice mixes have easy to follow instructions on each pack for flawless and authentic meals. This is a limited time offer - limited quantities available. Shan Curry powder is your savior for making every day delicious Curries. 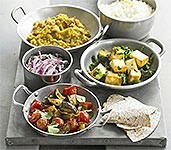 It can be used for meat, vegetable and lentil curries. Ingredients: red chili, salt, paprika, coriander, turmeric, cumin, cinnamon, ginger, garlic, black pepper, green cardamom, dehydrated onion, fenugreek seed, bay leaf, black cumin, clove, dried mango powder, dried tomato, dried papaya powder, citric acid, maltrodextrin, hydrolyzed soy protein, cane sugar, canola oil, silicon dioxide. No preservatives, no articial food color. The perfect masala topping for any dish that is topped with yogurt, specifically for dumplings topped with yogurt. Mix for Lentil Dumplings in Yogurt. Easy to follow instructions provided on the box. Only other ingredients required are plain yogurt, oil/ghee and sugar. Lentils cooked in a delicious, mild curry. A tasty dish usually served with steamed rice.